Today I was searching for a Facebook widget for my blog and Here is an interesting Facebook widget which I found on Internet, It's really great and attractive. It's actually a floating box with Facebook logo on it, When you hover mouse pointer on it, A like box appears with a slide. It looks awesome, Doesn't take time to load and really attractive. This widget will sure bring lots of likes on your blog fan page, I really liked it and I've personally used it on my blog. For a Live Working Demo, Click the button below. A Facebook Fan Page with Username. Before we can begin, You should have a facebook fan page with custom username. (example: www.facebook.com/theArea51blog). If you don't have it yet then Click Here for a tutorial. Step 1: From Blogger Dashboard, Go to Design > Page Elements. Step 3: Now Paste the following code inside the widget. 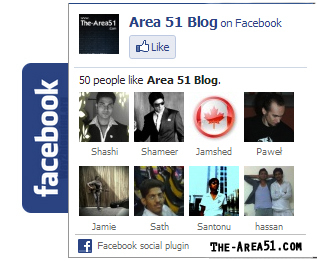 Step 4: Now Just Replace thearea51blog with your own facebook username (eg: facebook.com/username) and Save Widget. Step 6: Now Add the following Script just below the <head> in your Template. Step 7: Click on Save Template. Now you'll see a facebook logo on right side of your blog, Hope you liked this Tutorial, I tried to make it as simple as I can. So please Share it with your Friends using the widget on left. Please Like our facebook page if you liked this Turorial. Credits: This Widget Belongs to MyBloggerTricks.com and the code was developed by Harish from Way2Blogging.org. Thanks to these guys for creating such cool widget.